We had touched tragedy before, or at least brushed by it, but this felt different. This was aimed at America, and it had penetrated deep into our collective American heart. Together we shuddered at the sights and sounds. On campus, President Rose received the chilling message: “He, I feel, is lost and probably not to be found.” Everywhere students craved information about parents, siblings, friends who they knew were too close to the fire. In the end, we would learn the JMU community had lost four of its own. On JMU’s campus, the Classes of 2002, ’03, ’04 and ’05 gave blood in massive numbers. They held hands and cried together. There were no Republicans or Democrats that day, no blacks or whites, no liberals or conservatives. Just us. If we can rekindle, breathe life into the unity that we knew immediately after the towers fell, if we can place in permanent and proper perspective the value of each American above our own special and petty interests and opinions, then we can keep the gift from September 11. If that happens, those lost, including Bruce Simmons (’83), Craig M. Blass (’96), Matthew Horning (’97) and Brian Thompson, the father of Daniel Thompson (’03), will have died to create a world better than the one they left. Their lives, their deaths, will shore up the bedrock of a nation like none other: a nation that rushes to give blood, to aid neighbors, that shares its wealth and knowledge, that has as its foundational principal the inclination to lift each other up. Monuments built at Ground Zero, the Pentagon and Shanksville, Pa., will long tell the story of those we loved and lost on that fateful morning, as will the memorial on JMU’s campus. But monuments no matter how beautifully crafted, no matter how grand or expansive, do not sufficiently honor those who died. The only honor that will approach their sacrifice is if we unite to change the world. Our national unity, the precious and seemingly fleeting glimpse that appeared following September 11, must be reignited and stoked, in as much as we hold up a brilliant bright light for a dark world. Completely concur with FellowAmerican. Thank you for a beautifully written article. This was so beautifully written. My daughter is a sophomore at JMU. I will make sure she reads this too. Thank you. Thank you for the moving tribute to September 11. You really hit the nail on the head and captured the essence 9/11 that many people seem to overlook. I am a JMU alumnus and a survivor from the World Trade Center. I had been out of JMU for only a few months, having walked across the stage of the Convocation Center during my graduation in December of 2000. By August of 2001, I was working in the World Trade Center. I had landed an amazing job with Empire Blue Cross Blue Shield on the 28th floor of WTC 1. Most people had a pretty good idea of where my office was — it was pretty easy to spot with the big antenna on top of it. 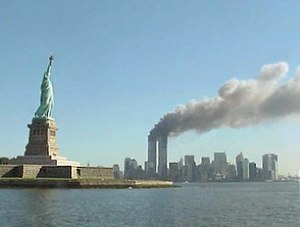 On September 11, 2001, everyone in the entire world knew exactly where my office was, and they were all watching in horror. I had been sitting at my desk when the first plane hit my building. I have replayed the day’s events in my head countless times over the last ten years, and I have shared my firsthand perspective of my escape with countless people. Yet, it is always fascinating to hear other people’s accounts from that day since everyone has their own unique point of view. It is especially fascinating to read stories from JMU students about how those events impacted the campus. After all, I was barely out of JMU at the time — it felt as if I had just stepped off the Quad and straight into the center of the most significant historical event of our time. As noted in this article, the silver lining of 9/11 was the sense of unity. Before that day, the corporate hierarchy in my company was quite clear and rather intimidating. On September 11, all hierarchy vanished as we were instantly united in our common cause. During our escape from the tower, I crossed paths with one woman who was part of the company’s elite upper management team. We were suddenly on the same playing field despite our mismatched corporate ranking. Slipping on the wet floors of the World Trade Center mall, we linked our arms together to help each other make our way to safety. There was even unity on the streets. Never before in New York City — a notoriously unfriendly city — could you approach a complete stranger to strike up conversation, ask for directions, or have a shoulder to lean on. Amidst the mayhem, a greater power truly prevailed. Thanks again for a well done article. I had the honor of knowing Craig Blass at JMU. He was one of the nicest guys I have ever met. We lost a great man on that day. I was a freshman at JMU on that awful day, this article truly depicts that day and the events surrounding it. Very well written, great job! I would be honored for you to repost. Thank you for your kind comment.